The Ourcq is a small river that rises in the Aisne department and flows into the Marne at Mary sur Marne. From the XVIth century onwards it had attracted the interest of watermen and was soon developed for the purposes of supplying the Paris area with timber for heating and construction. In the XIXth century, Napoleon decided to build a canal linking the Ourcq with Paris in an attempt to solve the serious water supply problems affecting the capital at the time. Work began on the 23rd of September 1802, a few months after the decree of the 29th of Floréal in year X (19th May 1802) was promulgated. The construction of the Canal de l’Ourcq was effectively completed in 1821, providing for the supply of drinking water to Paris and establishing a new route for the transportation of goods to the capital. The Bassin de la Villette, providing direct access to the Ourcq, Saint-Denis and Saint-Martin canals, witnessed a rapid growth in the transit of numerous products such as building materials, wood and coal. 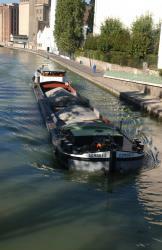 Commercial traffic on the Canal de l’Ourcq slackened off progressively during the second half of the XXth century, giving way to rail freight. Then, from 1983 onwards, pleasure sailing took over and gave the canal a new lease of life. Learn more about the Parisian canal's history. For a long time, the Canal de l’Ourcq had been regarded as a recreational and leisure amenity: this can be seen by a simple look at all the old postcards immortalising the festive events organised along its banks. And even today, the canal is a much-favoured location for events taking place on or by its waters. The redevelopment of the old towpaths has provided opportunities for rollerblading and cycling in surroundings that are a mix of urban townscapes and lush greenery and also a perfect setting for a family day out. So recreational strollers can be seen rubbing shoulders with more athletic enthusiasts on the banks of the canal, which runs between the Parc de la Villette and the Parc de la Poudrerie in Sevran. The more hardy of them can carry on beyond the Seine-Saint-Denis boundary to Claye-Souilly in a setting that is both pleasantly rural and a change of scenery and yet not far from Paris. 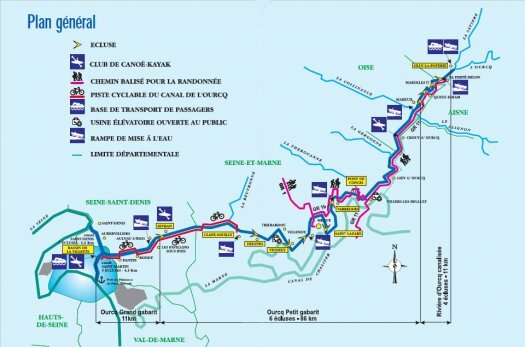 The sailing facilities on the canal offer excellent opportunities for sporting activities for beginners and practised sailors alike: trips for individuals and groups aboard specially adapted boats, and also canoeing and kayaking in Sevran and Zodiac dinghy-sailing in Pavillons-sous-Bois. 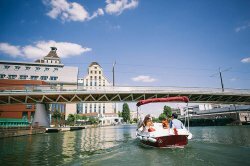 The best way to discover the Canal de l’Ourcq is by boat. You have different possibilities to sail on the canal: go on a cruise, rent a license free boat or take a shuttle during the Eté du canal. To learn about the history of the Canal de l’Ourcq and contemplate the buildings and must-see places bordering the canal, come to the Parc de la Villette! 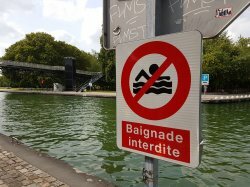 It is here that starts a 4 miles long hiking trail along the canal, marked out by information posts, which will lead you to the Parc de la Bergère in Bobigny. 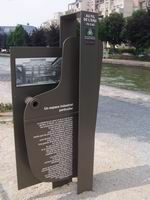 Put in place by the Tourism board of Seine-Saint-Denis with the help of the Ile-de-France region, this trail is more than just a walk along the canal. It allows you to fully appreciate the influence of the Canal de l’Ourcq over its close environment but also to discover the key steps of its history. If you don't like sailing but you find walking too long and boring, you can rent a bike to go faster all while discovering the history of the Ourcq canal. You can also follow the Street Art trail along the Canal de l'Ourcq!